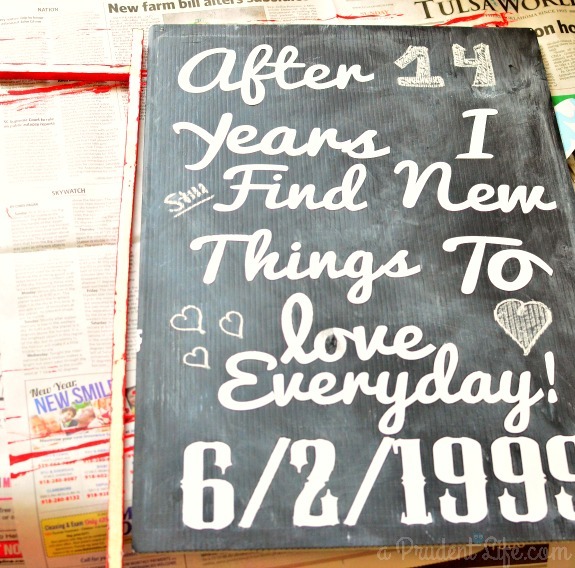 I’m a little behind the times and hadn’t had the chance to use Chalkboard Paint….until now! 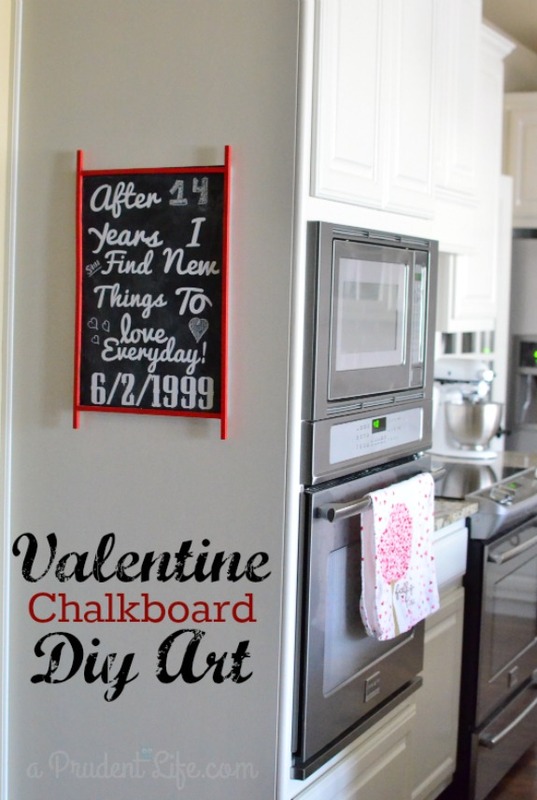 I came up with a great idea for a Valentine Chalkboard, and DecoArt was kind enough to provide the paint as part of their Blogger Outreach Program. 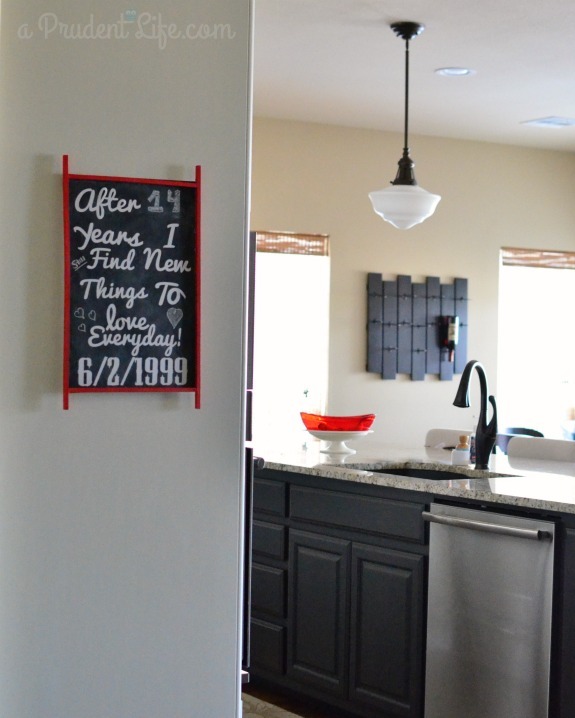 I wanted to make a combo sign that used our anniversary and some other text in vinyl, but had a chalkboard look and left room to update how many years we have been married in chalk each year. Instead of buying a canvas or using wood, I went a little experimental for my painting surface. I found a 3 pack of plastic 13 x 19 cake boards from Hobby Lobby for $5.39 (after 40% coupon). They were the perfect size for what I had in mind! At $1.80 each, I wasn’t too afraid of messing them up. 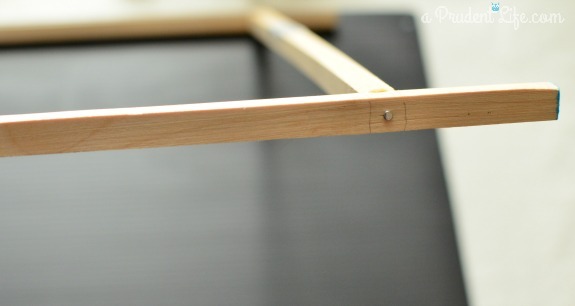 To make a frame, I bought two square 3/8″ x 36″ dowels for $1.23 each. Applying the chalkboard paint was really easy. You apply two coats, one hour apart, in different directions. So, the first coat I painted up & down and the second coat side to side. After waiting 24 hours for the paint to cure, it was time to condition the chalkboard. Rub chalk all over & then wipe it off. After that, your chalkboard is ready to use. Easy! 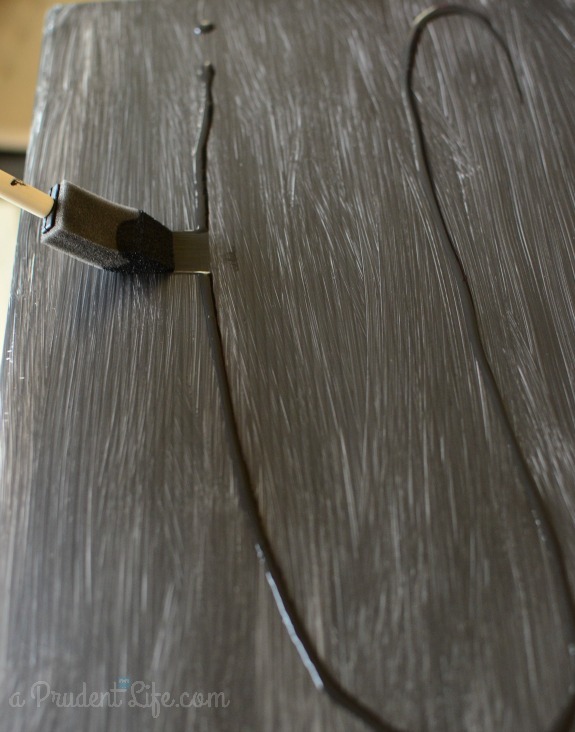 The ridges in the cake board inspired me to model the frame after an old washboard. I cut the side (vertical) dowels 2 inches longer than the board so there would be overhang. To make the frame, I used some wood glue, then nailed the corners together with my trusty pink hammer. Next up, I painted the frame using Americana acrylic paint in Red Alert to add some Valentine red. It took two quick coats. While the frame was drying, I cut out the words I needed with my new Silhouette Portrait. I love that thing!!! 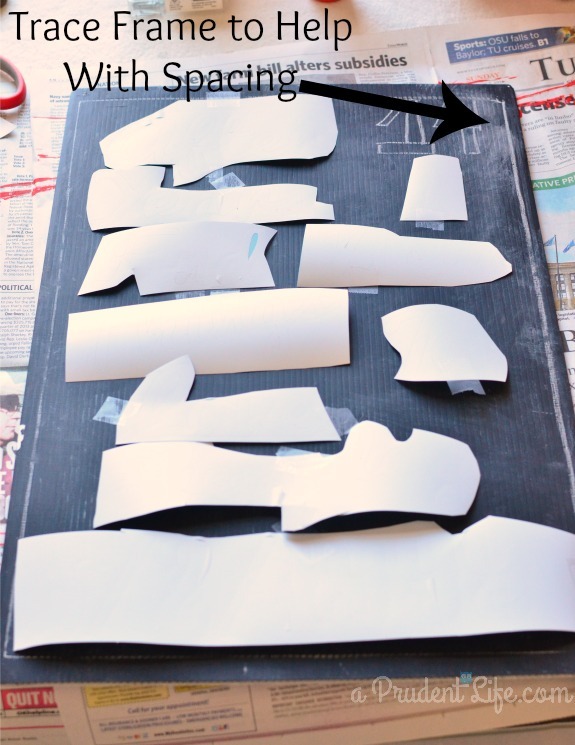 You could easily use scrapbook letter stickers OR freehand chalk the words if you don’t have a vinyl cutter. I don’t have chalk art skills, as you’ll see by my 14 in the finished product 🙂 Once cut, I taped the words to the board to figure out the spacing. Yippee – almost done and I’m loving it! To attach the frame, I used super glue gel from Dollar Tree. 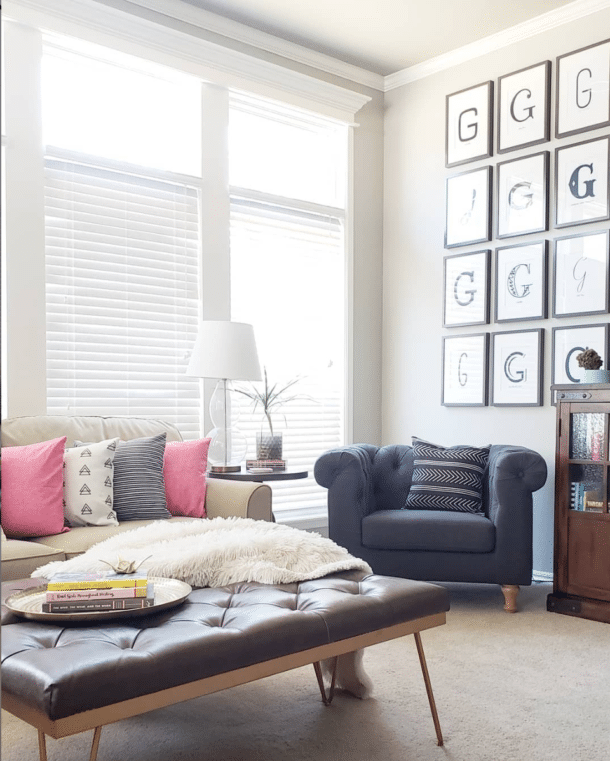 To hang my new art, I used Command picture hanging strips. They are amazing, especially for seasonal decor. 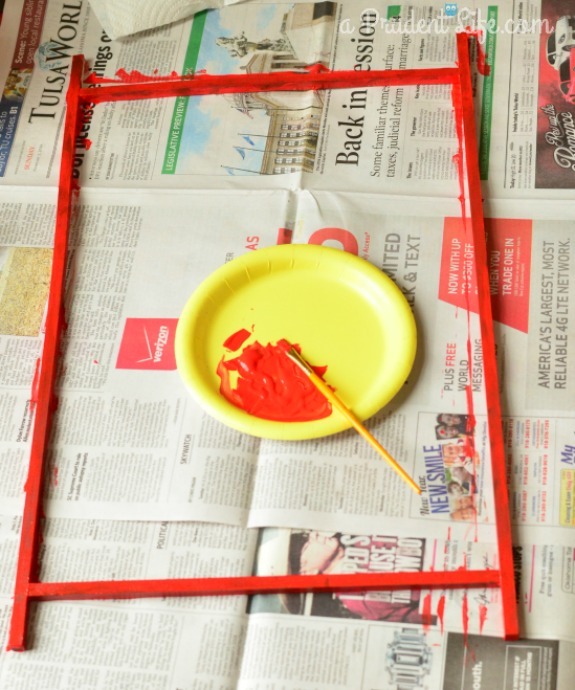 I love the pop of red the frame provides – it pulls together my other little Valentine touches. It will be so much fun to update the “years together” section when I bring the Valentine’s Day decor out each February! The chalkboard paint was really easy to use, just remember to give yourself time to let it cure overnight before you condition your new board with chalk. 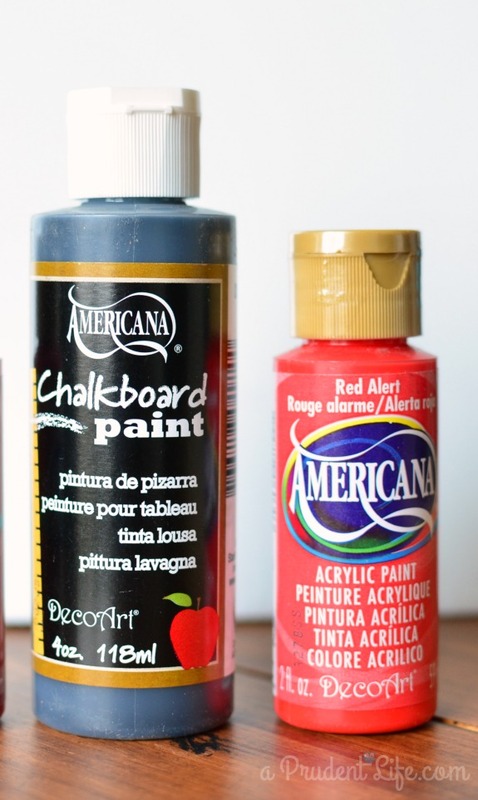 I still have a 1/2 bottle of chalkboard paint left and can’t wait to try it on something else! Oh my goodness! I love this, Melissa! The frame is perfect and the vinyl/chalkboard combo is adorable! Great job! This is really cute Melissa. I love the saying. Thanks for partying at The Makers! I absolutely love how this turned out! What a sweet way to celebrate your marriage! I would love it if you’d link this up to the Frugal Crafty Home Blog Hop. Our readers get really excited about craft projects like this! Thank you! Thanks for the invite Carrie, I’ll be right over to link up! I absolutely love that I found your project through the hit me with your best shot link up. 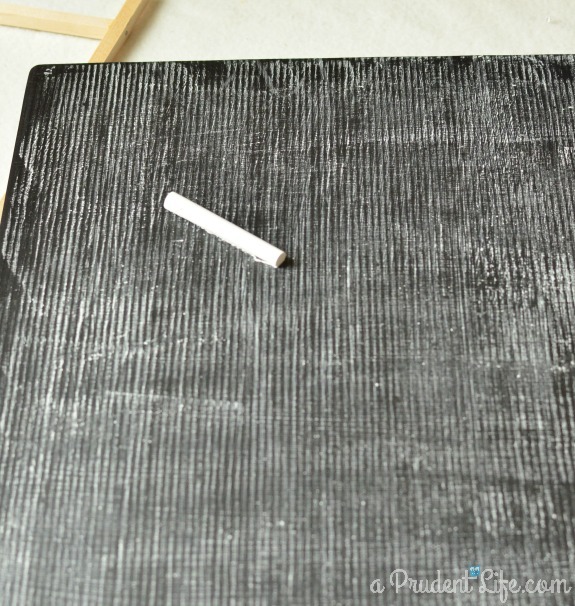 I’ve been wanting to make a chalkboard but have yet to find the materials, this is a great variation. I’ve pinned if, and plan on creating my own soon. Thanks for visiting & pinning Mary! The patience giving the paint time to cure was tough because I wanted to try it out right away, but everything else was really easy. Good luck with your chalkboard! Awwww this is so sweet and super modern looking! I am a sucker for a chalkboard. Love this! Me too! I can’t believe I waited so long to make one! This is such a fun craft! I pinned so I could find it later. So cute! That is so sweet and looks fantastic! I love the red frame and the style. What a great DIY project. Thanks for sharing. So cute, Melissa! I love chalkboard! Love this! 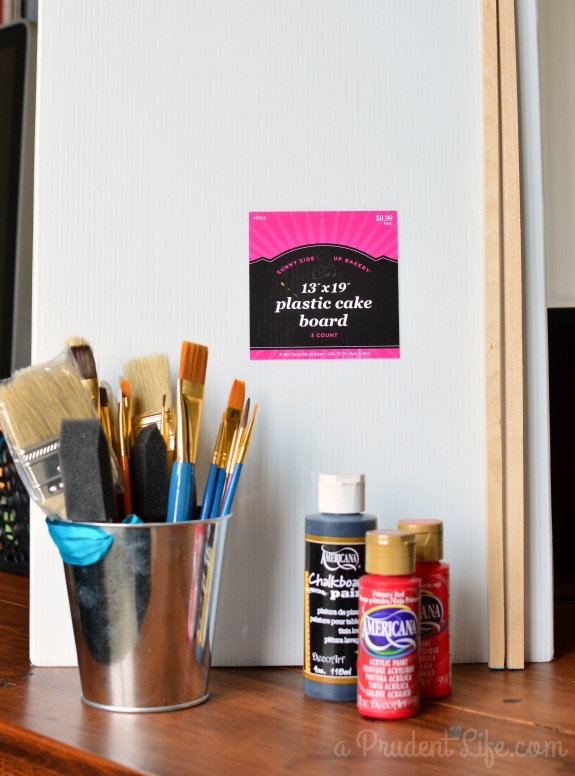 Such a great idea- I would never have thought to use a plastic cake board! Thank you Laura! I was excited when I saw them at Hobby Lobby and realized they were the perfect size! Love this! Thanks for linking at Share it Sunday!! Pinned! Thanks for visiting AND for pinning Sondra! LOVE this! So perfect for Valentine’s Day! I was late getting on the chalkboard train, too, and now I want to paint everything with it, lol. Thanks so much for sharing at Hit Me with Your Best Shot! Have a wonderful week! Thanks Abby! My husband is lucky that every surface in our house isn’t gold or chalkboard! I love the pop of red with the black & white! *This was one of my “Knockouts” from this week’s Hit Me With Your Best Shot! Thanks SO much for linking up! I absolutely love this idea! 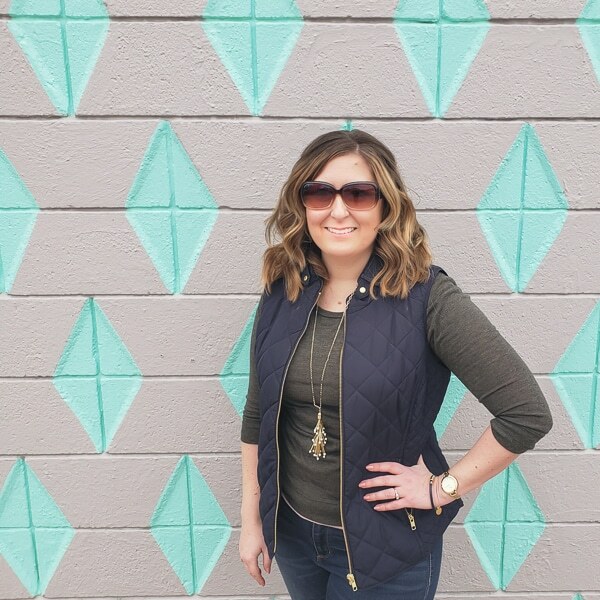 I am always looking for a way to use chalkboard paint and I think this came out perfect! Pinning this for future reference! Thank you for visiting & pinning Mandy!